Clouds were one of my first loves. When I was a little girl, lenticular clouds resembled the classic flying saucer U.F.O. I don’t see them often, so I was happy to capture this photo on a relatively cloudless mid-January evening recently. My dad died in 2011, when I was 37 years old. It happened suddenly, with no warning, and it broke my heart. I had spoken to him on the telephone just a couple of hours before he died. He sounded happy. He sounded fine. I knew he was getting older, I could see it. Sometimes I would think about him dying, but I still thought I had at least ten more years with him. He was only 63 after all, and in my mind, that’s not very old. Dad did not exactly have an easy life, and the hard times caught up to him sooner than I had hoped they would. 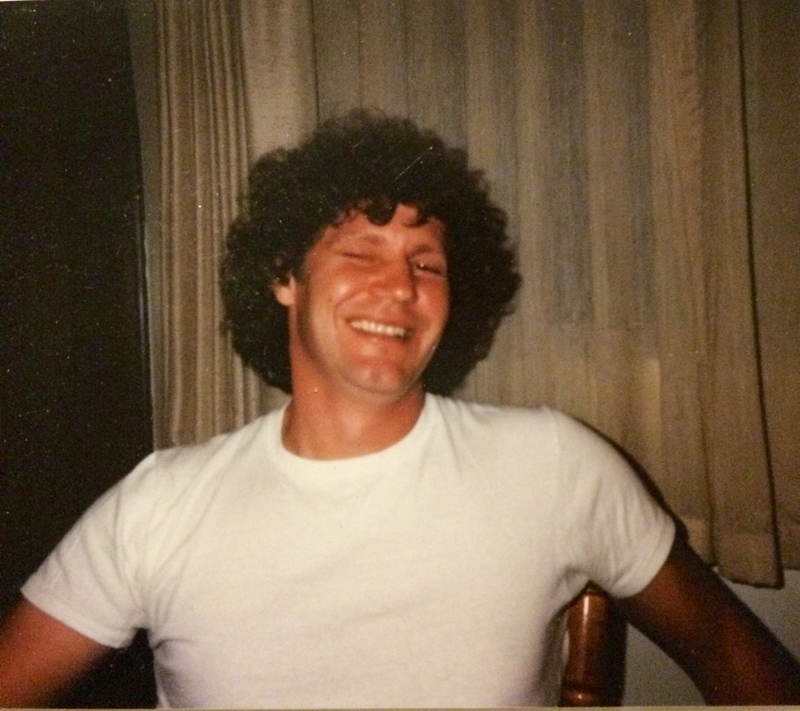 Dad and I had a rocky relationship through my teen years and twenties, and it wasn’t until I reached the age of thirty that we began to see a little more eye to eye. I really enjoyed our newfound relationship and relished in the time that I got to spend with him, either talking about politics and current events, working on the Sunday crossword, or just being silly together. Dad was a generous guy and his tradition was to give me $100 for my birthday every year, which I greatly appreciated! And he loved to share his zip up sweatshirts with my sister and I; he knew we loved them because they were cozy and too big for us. If we ever complained about being cold, he would hand us one of his sweatshirts and insist that we put it on. Fast forward to 2014. 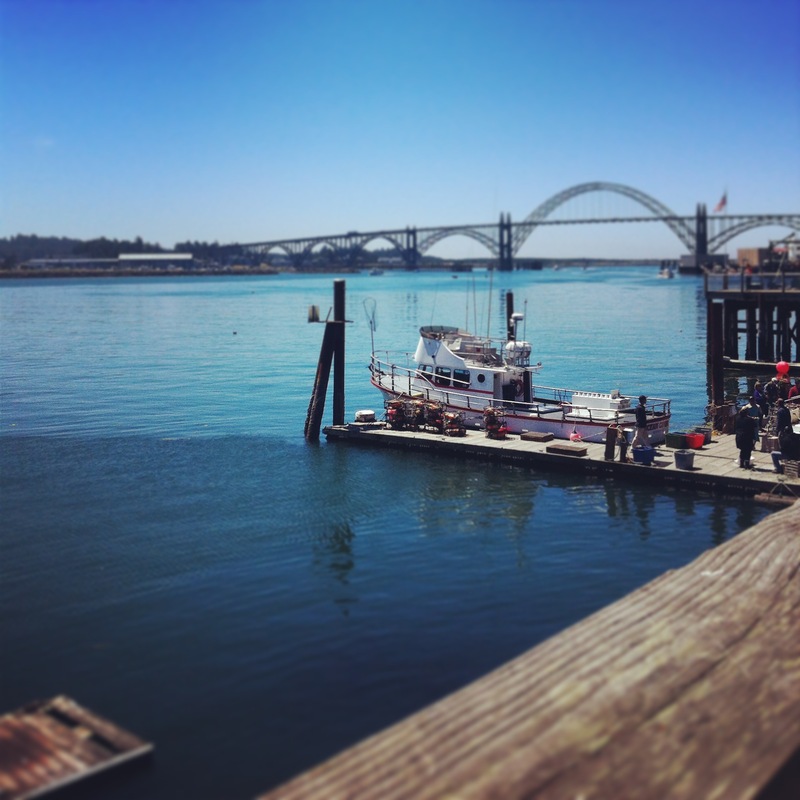 I packed the kids up and we took a road trip to the Oregon Coast for summer vacation. On the way, we stopped to visit my mom, who had moved to Oregon to be with my sister and her family after Dad died. We spent the night at my sister’s place and planned to caravan to the coast together early the next morning. I happened to wake very early that morning, about 4:45am. I laid in bed and thought about getting up and showering before the whole household got up, but decided that I could probably use another hour of rest for the drive ahead. I closed my eyes and quickly drifted back in to a slumber. It was during this extra shot of dreamy sleep that Dad came to visit me; the first and only time since he has passed. I am a skeptical person, and typically do not believe in things like ghosts and gods. However, some things happened in the hours immediately after I dreamt about Dad that were too much to ignore. Recalling the dream brings tears to my eyes, but even more so, the events that followed after I awoke. When I went back to sleep that morning, my dream seemed very real. It was as if I had not really gone back to sleep, but instead had decided to get up and shower-exactly what I had been thinking about doing. After the shower, I got dressed and went to the kitchen to make coffee. When I flicked the kitchen light on, much to my delight, there was my daddy! He was smiling, sitting at the table with a pot of coffee already made. My heart skipped a beat, and I felt such joy. I walked toward him to give him a hug, but as I got closer he began to fade, and by the time I made it to where he was sitting, he was gone. I started to cry, and that is when I woke up. I’m sure I am not the only person to have a dream that ruined a day. A day ruiner- on a day that was supposed to be exciting- I was taking my boys to see the ocean for their first time! I was deeply disappointed by my teasing dream, and there were tears hanging in the corners of my eyes. I tried to feign happiness so as not to upset my mom or sister, and I decided not to tell them about it. The morning went on, everyone was busy getting ready to go. My mom came upstairs from her room holding a blue sweatshirt and handed it to me. She said it was Dad’s, and that I should take it to the beach with me for extra warmth. I thought to myself that it was just a tiny bit odd that I had just dreamt about Dad, and soon after she gave me something of his. We loaded into our vehicles and headed out. I asked my brother-in-law to stop at a gas station so I could fill up, and I followed him down the road. When we stopped for gas, I went in the store to get a few snacks for the kids. The cashier was friendly and talkative and mentioned to me that her 40th birthday was coming up in a couple of days. Mine was too, I told her. July 6th. Her eyes widened, and she exclaimed “I can’t believe it, so is mine! I’ve never met anyone with the exact same birthday as me!” Come to think of it, I hadn’t either. I left the store with a smile on my face. What a funny coincidence, to meet a random stranger in a different state that was born on the same day as I. It brought me out of my bad-dream doldrums a little bit. My smile quickly turned into a frown when I hopped in the car, turned the key, and-nothing. I had accidentally left the headlights on while I was in the store, and the battery died. Thank goodness for family. With the help of my brother-in-law, we pushed my car out of the gas island and got ready to jump-start it. While everything was going on, I happened to notice a little old lady in a super fancy white Mercedes-Benz who was curiously watching us from across the parking lot. She even drove around the parking lot a few times, circling us from a distance, and watching. We finally got my car started and I was about ready to get back in, when I turned and saw that the little old lady had pulled up right next to me. She was a beautiful woman of about eighty years, with shiny white hair to match her car, and big, round, dark sunglasses. I said hello, and she asked me if everything was okay. I told her it was, that I had accidentally drained the battery while they were pumping my gas, but we got it started and everything was good. She asked if I was taking my kids to the coast for a vacation, as she had noticed my out-of-state license plates. I told her that I was, and that we were really looking forward to it. She told me to have a wonderful time and warmly grabbed my hand. I felt her slip something into my hand, and realized that it must be money, but I did not look at it. I told her that I really appreciated the gesture, but that we were okay. She smiled at me, insisted that I take it, told me to enjoy my vacation, then she slowly drove away.It was so sweet, but I didn’t need the money, and I felt kind of bad that she gave it to me. As I watched her drive away, I opened my hand to find two wadded up bills. I was expecting them to be two fives, but when I unrolled them, I saw that they were two fifties. One hundred dollars. The rest of the drive to the coast was somber as I thought about my dream, the sweatshirt, the cashier with the same birthday, and the little old lady in the white Mercedes and the hundred dollars. All of this happened within a period of about five hours. How did they connect? Or did they? Finally, I realized exactly what happened. My dad, he came to me in my dream to say hello, and to make sure that he was on my mind. Through my mom, he gave me his blue sweatshirt to keep me warm at the coast. He reminded me of my birthday at the gas station through the cashier, and the little old lady was his medium, his way to give me my birthday money. I still don’t believe in ghosts or gods. But I do believe that something happened to me that was more than just a coinky-dink. Was the little old lady an angel? Perhaps our spirits or souls inhabit some other plane of consciousness and my dad was able to harness energy from it. I don’t know. I’ve thought about it every day since it happened, and the bottom line is that I’m happy that it did, no matter what the explanation is. I wonder if Dad will ever come to visit me again? I found a cute little gift shop in Newport, one of my dad’s favorite coastal towns. He took me to the Oregon coast for the first time when I was 2 years old. I have a treasured picture of a young him tossing me high in the air at the beach, his pants rolled up and his bare feet in the sand, a huge sea stack in the background. I bought myself a ring at that gift shop with the money, and when people ask me about it or compliment me on it, I tell them it was a birthday gift from my dad. Okay, okay. I get it. Chalk painting is the ‘it’ craft lately. Everybody’s doing it. Annie Sloan seems to have a corner on the chalk paint market right now, and unfortunately (or maybe fortunately?) for me, you can’t purchase it online and the closest place in my state that sells the stuff is 350 miles away. It’s not exactly easy to obtain. Plus, it’s a tad on the pricey side (a quart for $35! ), if you ask me. I decided to scour the interwebs for a chalk paint recipe. I found one that sounded reasonable (see here), made a list and headed to my *local hardware store* to get some supplies. 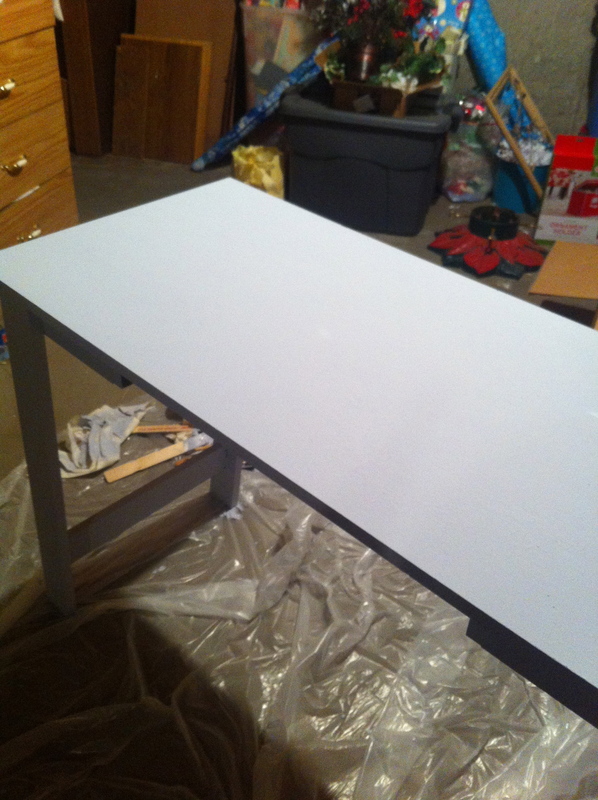 And of course, I needed something to practice on, so I chose this ugly, cheap old desk. 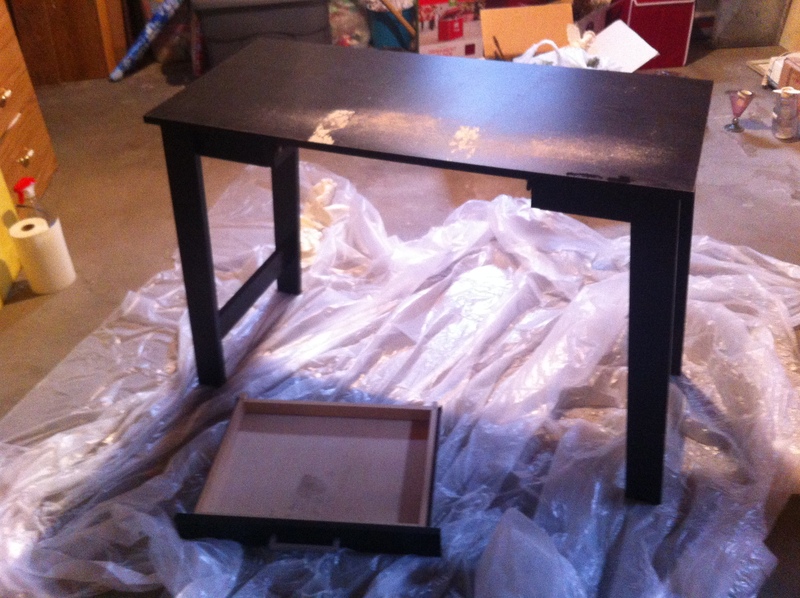 It was painted black and is made out of cheap wood – I’m pretty sure it’s particleboard. I confess, I was kind of worried about painting over black and not sanding or priming it first. But, I followed the directions on the blog and did my thing. The original recipe called for 4 tablespoons of POP and 2 tablespoons of water. This did not work for me. 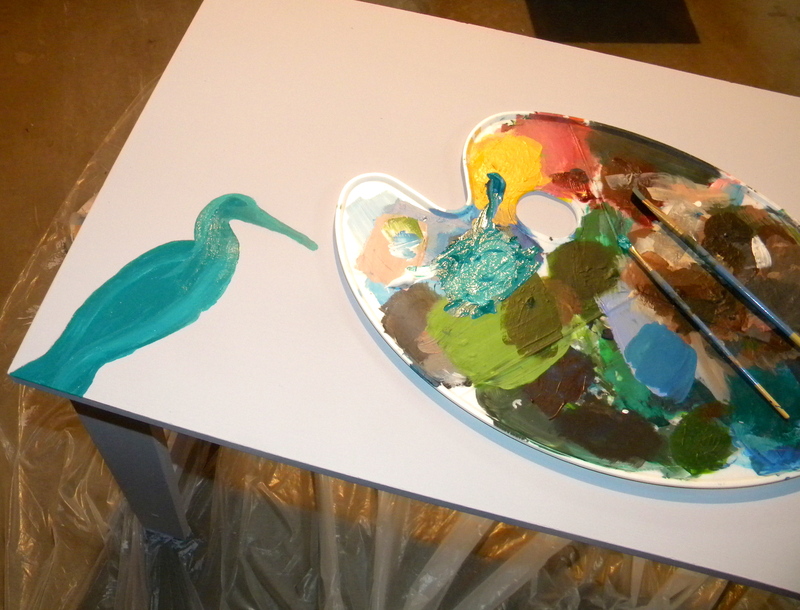 I mixed it smooth, but it was too thick and it ended up clumping up in my paint. I had to scoop the clumps out and make a new batch, but this time I used equal parts water/POP. I added it to my paint, mixed it up and went to work. It can’t be too thick and it can’t be too thin. That is the trickiest part. The black was really bleeding through, so I was beginning to wonder if this was all a big mistake. But after coat 2, it looked really good! 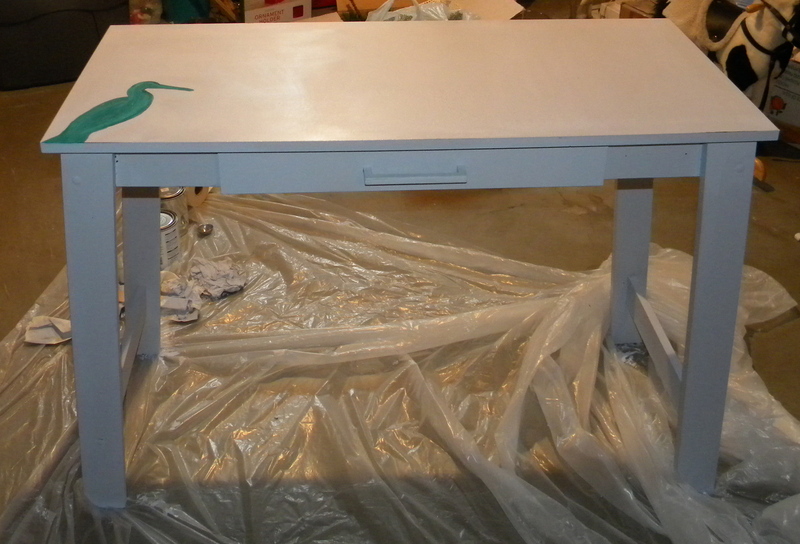 I added one more coat of paint and then I decided to paint a bird on it to give it a little extra flare. 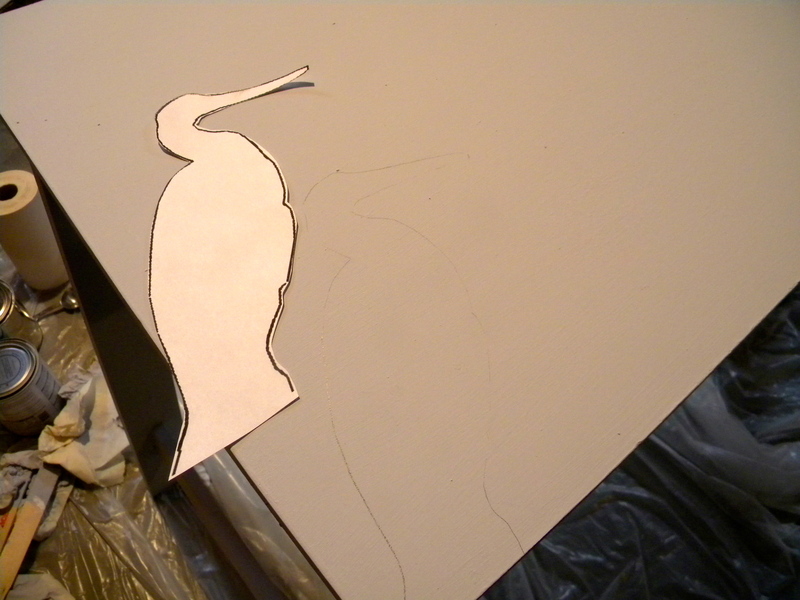 I found an outline of a heron online and printed it out. I traced the outline of it with a pencil and then got out my acrylic paints and filled it in. After the bird dried, I waxed it all over with finishing wax. I was going to distress this with sandpaper, but when I started sanding it, I didn’t think it looked right on this particular piece of furniture, so I painted over it. I’ll have to try the distressing feature on another piece. 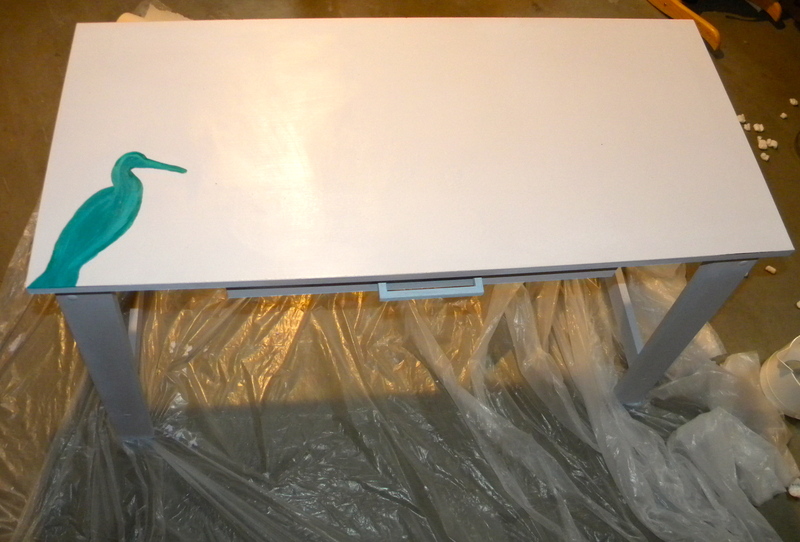 Hey, I think it looks pretty decent for it being my first time furniture painting endeavor! Now I just need to find a space to put it! I can’t wait to paint more furniture. I have a couple of old kitchen chairs that are just dying for a new look! 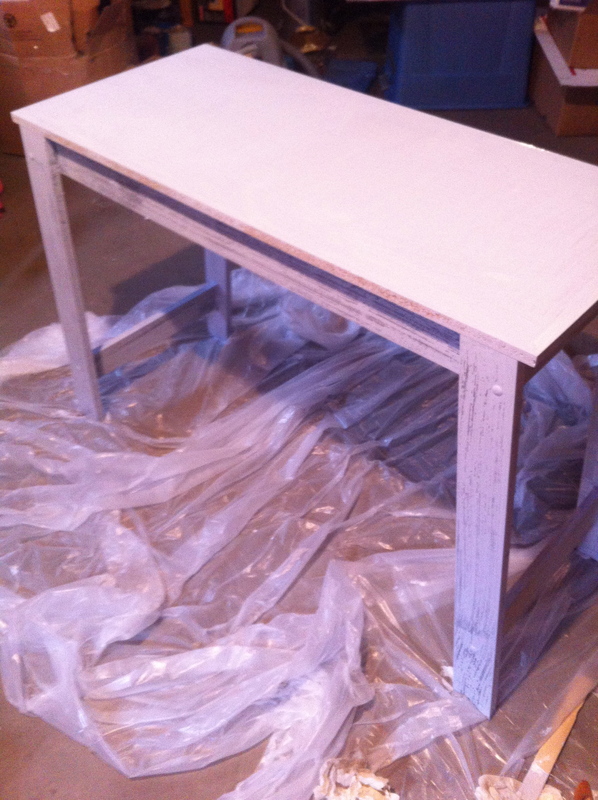 I am feeling inspired after this project.On an end note, I think the make your own chalk paint worked well. If you’re feeling crafty, give it a try! The possibilities are endless! I have been daydreaming about spring all day today. Oh spring, the things I would do to you. If only you were here with me now. I want to smell you and take you all in. I can’t wait until the day we meet again. I took this photo last spring from the National Bison Range in Moiese, Montana. It was an absolutely perfect morning. Imagine my delight all these years later when I decided to jump on the cruciferous bandwagon and discovered that, when cooked and seasoned right, kale, bok choy, brussels sprouts, broccoli and cabbage can be incredibly delicious. Kale and its cruciferous friends are veggies that have numerous health benefits. When eaten in the recommended servings of 1-1/2 to 2 cups 3-5 times a week, kale can help decrease your cancer risk. Not only that, but it also helps support body detoxification and can help lower your cholesterol. Kale is truly a super food! For all the great nutrition information on raw kale, click here. Tonight, I made a simple and flavorful kale slaw with lemon and parmesan. My local grocery store had BOGO bags of kale/chard/baby spinach, so I cheated and got that. Otherwise, just pick out your favorite kale. And if you don’t have a favorite, just choose any variety. They’re all good. If you buy a head of kale, wash it thoroughly and dry it well. Then, cut the thick stems away and chop up the remaining leaves. Use the whole head! Next, wash about 10 small brussels sprouts. Cut the ends off and peel of the first few outer leaves. Then just slice them up and throw them in the bowl with the kale. In a separate small bowl, whisk together about a 1/4 cup of EVOO, the juice of a whole lemon (or less if you want it less tart), 2 smashed and minced garlic cloves and some kosher salt. Then a pinch of pepper. Pour it over the kale mixture and sprinkle with a little parmesan. Toss it all together. Let it stand and soak up the flavors for at least 5 minutes. 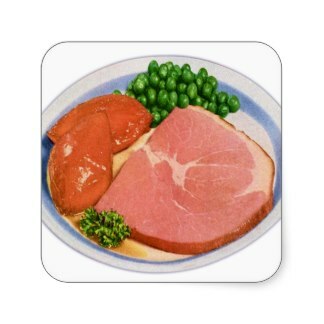 I prefer to put mine in the fridge for about 15 minutes before serving. Before serving, toss with a little extra parm, and voila! 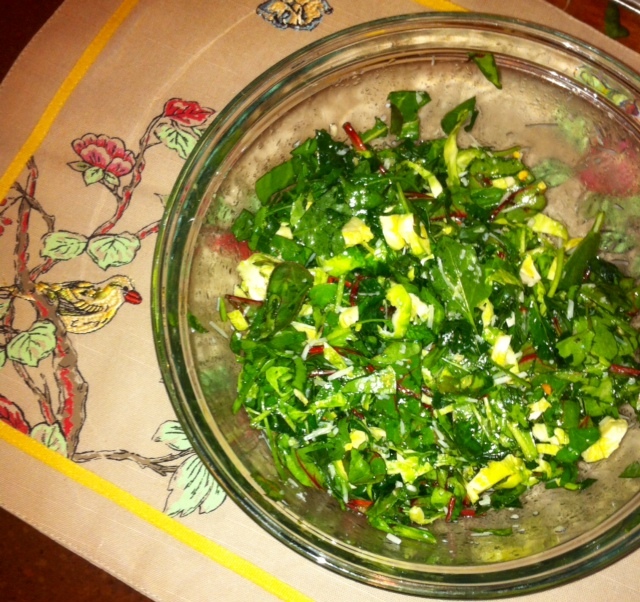 A lovely, healthy cruciferous salad. Enjoy! This is my year of forty. I never thought I’d see the day to be perfectly honest. Nevertheless, here I am, the minutes counting down the hours until the big 4-0. How could this be? In my mind, I don’t feel a day over twenty nine. 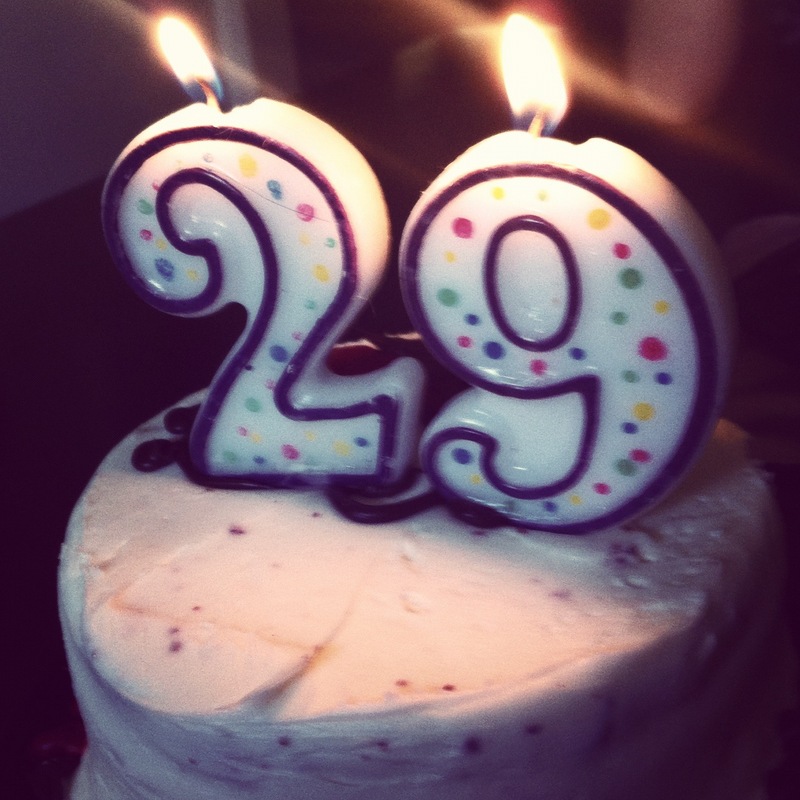 In fact, through my entire thirties, I turned 29 on every birthday. On the outside, though, I can see the subtle effects of an aging body. Fine lines and creases have appeared on my forehead and just in the last few months I’ve started noticing grey hairs sprouting around my temple. It’s nearly impossible to lose five pounds, but I could easily gain it in a day. Too much pizza all of the sudden gives me epic heartburn and I’m pretty sure I have a case of mild arthritis in my hands. Perfect timing. BOOM! Old. Just like that. The twenty-something me loved partying. She was on the go all the time, never tired, never worn out. She was fashionable and thin (even though she constantly complained about how fat she was). She got any job, any man, pretty much anything she wanted. But she chose the wrong things, lousy men and friends. She wasn’t good at making good decisions. She liked to live on the edge and defy authority. When I approached thirty, I saw a need to change. I had come to a standstill and things weren’t so good in my life. It was a tough decision, but I quit my job, moved to a different state and shortly after met my current partner in crime. Throughout the last decade, we’ve added two children and a dog to our family. Besides adding two beautiful, smart, healthy boys to my life by becoming a mom, another really cool thing that I did in my thirties was decide to go back to school. A college degree was something that I always felt ashamed of not achieving. I was tired of the dead end jobs and I wasn’t doing something career-wise that I loved. Or even liked, for that matter. So here I am, almost forty and a senior in college. I’m rocking it, though. Making the Dean’s list every semester. Soon I will be an Anthropologist/Archaeologist/Historian, and with that, hopefully a reliable and enjoyable career to spend the rest of my working years doing. In the meantime, I am discovering my soon to be forty year old self. I am realizing how important my health and well being are. I discovered that I really am creative, even though I’ve told myself all these years that I’m not. This blog is an extension of that desire to be creative. I have an urgent longing to do, see, and experience as much as I can with the resources that I have available. I’m starting to realize that life really is short, and I’ve got lots to do yet. I’ve decided that no matter how much it bothers me deep inside, that I’m going to really try to embrace turning forty. I need to make it a positive experience and not let it bring me down. I need to make the rest of my life a happy journey, because damn, I’ve reached half my life expectancy already. I’m going to share tidbits of my life on this blog. Photographs, discoveries, art, food, interests, places, thoughts, ideas. Hopefully you’ll find it interesting, entertaining, enlightening and inspiring.